Gov. Linda Lingle and Hawaii's hoteliers are recommending that the Hawaii Tourism Authority funnel an additional $10 million into marketing to shore up the state's struggling key visitor industry. Lingle and Lt. Gov. James R. "Duke" Aiona Jr. met with 25 hotel owners and operators for 90 minutes on Tuesday to make a plan to get Hawaii's tourism industry back on track. "Investing in marketing our state's visitor industry is crucial to conveying our message that Hawaii provides visitors with value," Lingle said. "This investment is not just about filling hotel rooms, but is critical to all other industries, including retail, restaurants, tour operators, car rental companies, visitor attractions, and the countless other businesses that rely on tourism. Investing in marketing Hawaii will result in increased revenue to the state and the bolstering of our economy." In addition to intensifying marketing efforts in Hawaii's core U.S. mainland market, efforts are being made to further develop niche markets. Hawaii's hoteliers are reaching out to the kamaaina market with special rates and package deals and state leaders are looking to Asia to fill gaps. Lingle and Aiona are discussing making tourism-related trips to California and both have planned separate trips to Asia in November to promote the state's visitor industry. Pacific Office Properties Trust Inc., a West Coast office building real estate investment trust, said yesterday that it has closed on a revolving credit facility with KeyBank National Association that has a maximum amount of $40 million. Proceeds will be used to acquire opportunistic and value-added office properties. Pacific Office's portfolio consists of 23 properties totaling 4.3 million leasable square feet in Honolulu, San Diego, Los Angeles, Orange County and Phoenix. The Coral Reef Alliance has joined forces with Leisure Pro, the largest online scuba diving and snorkeling merchant, to raise awareness about coral reefs. To support this partnership and CORAL's Take a Bite Out of Fish Feeding campaign - an effort launched in Hawaii to eliminate reef fish feeding - Leisure Pro has agreed to stop selling fish food, CORAL said yesterday in a statement. The practice of feeding fish can have disastrous effects on coral reefs by altering predator-prey relationships and pushing delicate ecosystems out of balance, CORAL said. American Savings Bank will hold its monthly "First Saturday" community collection program on Sept. 6 in support of Goodwill Industries of Hawaii Inc. Forty-eight of the bank's 63 total branches will serve as collection points for donated items designated for a nonprofit organization on the first Saturday of every month. Requested items include men's business suits, aloha shirts and shoes and women's business suits, skirts and shoes. 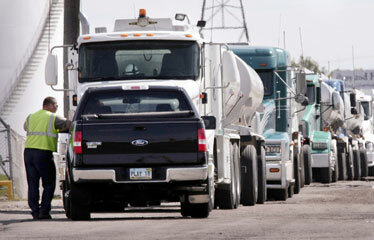 GET IN LINE: Tanker trucks waited in a long line yesterday to load fuel at the Magellan Pipeline Co. in West Fargo, N.D. Industry officials say they are mystified by fuel shortages at terminals in the upper Midwest in recent days, but they expect enough supplies for Labor Day weekend. WASHINGTON » Federal regulators yesterday proposed a plan to allow public companies to begin using international accounting standards for reporting financial results in two years, and may require them to do so starting in 2014. The push by the U.S. Securities and Exchange Commission toward acceptance of a single, global accounting standard has raised objections from some investor advocates and key lawmakers. Supporters of the change say it makes sense in an era of increasingly globalized financial markets and would help lure foreign companies to U.S. markets. NEW YORK » ConocoPhillips will sell the remainder of its gas stations in the United States, the company said yesterday, though Conoco, Phillips 66, and 76 will continue to operate under those familiar signs. The 600 or so stations are being sold to Pacific Convenience & Fuel LLC, a subsidiary of PetroSun Fuel. The deal is "in the ballpark" of $800 million, said Sam Hirbod, chairman and chief executive of PetroSun and Pacific Convenience. » Lenox Metals has hired Scott Stephenson as staff manager. His 14 years of management and training experience include human resources manager at Lowes HIW, guest services manager at Royal Kunia Country Club. He began his management career at Burlington Coat Factory on the mainland prior to moving to Hawaii in 1996. * Jerry Felipe to University of Hawaii at Manoa branch manager. He joined the bank in 1997 and will continue his duties as McCully Young branch manager. * Yvonne Konia to assistant vice president and manager of residential loan administration services from residential loan administration services manager. Her 30 years of banking industry experience include joining American Savings Bank in 2006 as operations coordinator and vice president and loan servicing manager at Bank of Hawaii's mortgage banking division. * Taffeta Burr-Lewis as senior sales manager. She was previously associate director of sales and marketing for Hornblower Cruises & Events in San Francisco. * Karishma Chowfin as contract sales manager. She was previously senior hotel assistant manager at The Kahala Hotel & Resort and has years of sales and operations experience at ResortQuest Waikiki Beach Hotel. » East-West Center has re-elected President Charles E. Morrison as chair of the Pacific Economic Cooperation Council (PECC). He is the first chair to have served a three-year term and the first American to chair the council since 1993. » The International Council of Shopping Centers has elected William A. Brizee as Hawaii State Alliance co-chair for 2008-2009. He has been an active member of the council since 2000, and had also served as chairman of the AIA Honolulu Building Codes Committee from 1997 to 2007 and currently serves on the Waikiki Improvement Association board of directors. » Ameriprise Financial has certified senior financial advisor Eric Fujimoto as a Private Wealth Advisor at its Honolulu office. Private Wealth Advisors are a specialized group of financial advisors who receive specialized training with focus on affluent clients, offering solutions in the fields of retirement, tax and estate planning, and insurance and asset management. » The National Association of Realtors Council of Residential Specialists has awarded RE/MAX 808 Realty realtor associate Cindy Siok with the Certified Residential Specialist (CRS) designation. Realtors with the CRS designation have completed advanced courses and have demonstrated professional expertise in the field of residential real estate. » Honolulu Lite: Rail or bus? Burro, jeepneys?